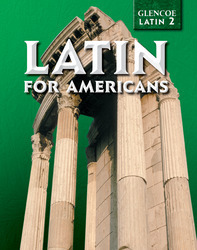 COMPLETELY REVISED TO BRING LATIN INTO THE 21st CENTURY This best-selling series offers a solid approach to teaching the Latin language and the Roman culture. A new visual program includes colorful photographs and fine art reproductions that add interest to the lesson. Emphasis on derivatives helps expand students’ English vocabulary. Group and Paired Activities encourage students to think critically and creatively and promote the active use of Latin. Cultural readings provide your students with a knowledge of Rome’s influence on the modern world. An Assessment section following each unit allows students to gauge their progress and prepare for Unit Tests. A carefully paced, logical presentation of Latin structure and grammar enables students to grasp concepts more easily. A complete and concise review of Level I prepares students for the transition to Level II. Lesson LIII: Caesar Says: "You Shall Not Pass"
Lesson LXXIV: The Atuatuci Make Fun of the Roman "Tanks"